Trinamool leaders have claimed the NRC process and subsequent verification is vote bank politics. Other critics call it as modified ethnic cleansing. But putting poll rhetoric aside, the issue dates back to a time when many of these leaders had no political relevance. Remember the excitement around Y2K? Dire predictions were made about what would happen on the midnight of December 31, 1999, ranging from an apocalypse to a Dali-esque meltdown of all computing devices. In fact, nothing of the sort happened. January 1, 2000, dawned just like another day and although anxieties persisted, no major disruption was reported from any corner of the globe. Much the same applies to the National Register of Citizens, the Supreme Court-ordered determination of who is an Indian citizen in Assam and who is not. The draft of the NRC was unveiled on July 31. Amid warnings that Assam would become a seething cauldron of competing identities, leading to rioting not just in the state but along the border, an apprehensive and tense India awoke to a calm and tranquil Assam. True, there were some reports that on the Meghalaya border, some student groups were stopping buses and demanding passengers produce identity cards (possibly as a novel method of extortion), but the state intervened and the extortion lasted just two hours. Although tension was reported from the Barak Valley, the number of ‘undocumented’ Assamese here was just around 40,000, so the tension dissipated. Now, those whose names are not on the draft NRC are systematically petitioning, claiming discrepancies. First the numbers. The names of 4,007,708 people were excluded from a list of a total 32,991,384 applicants. The ministry of home affairs and the Registrar General of India have already said that the people excluded in the final draft don’t stand to be deported: You would be forgiven for asking where, because these people, allegedly migrants (mostly Muslims) from Bangladesh into Assam are not accepted as Bangladeshi citizens by Dhaka. The erstwhile East Bengal and Assam have always seen migration, changing demographic patterns. Tea garden workers arrived in phases and so did others from East Bengal. After India’s independence, the Sylhet referendum changed everything. Held to decide whether Sylhet would remain in Assam and join India or the province of East Bengal, or then East Pakistan, the referendum decided on joining Pakistan, though the BarakValley remained in Assam. But unlike the partition of the two Punjabs, very few returned to East Pakistan, opting to stay on in India. The first National Register of Citizenship was prepared in Assam in 1951 to identify illegal immigrants and maintain a database of citizens. In the years leading to the formation of Bangladesh with the internal turmoil in East Pakistan surrounding the 1971 war, there was an exodus to India. This was evident in Assam’s population, which increased by nearly 35 per cent from 1951 to 1961 at a time when the national growth was a little over 22 per cent. Between 1961 and 1971, the state population again grew by 35 per cent. The interpretation was that Assam was bearing the brunt of influx that manifested itself in the massive demographic changes in the state. Post-1971, Assam also saw a 50 per cent increase in voter turnout, thereby changing the political landscape. This led to resentment among the locals who believed that immigrants, over time, would begin to dictate politics and culture in Assam. This was the central grievance of the Assam agitation that ended with the signing of the Assam Accord in 1985. The Assam Accord was a memorandum of settlement signed between representatives of the Government of India and the leaders of the Assam movement. According to the accord, all foreigners who had entered Assam between 1951 and 1961 would be given full citizenship, including the right to vote. Those who had done so after 1971 were to be deported. The immigrants who came between 1961 and 1971 were to be denied voting rights for 10 years but would be given all others rights of citizenship. That’s how the base year of 1971 considered for the NRC came about. The NRC has been updated to include those persons (or their descendants) whose names appeared in the NRC 1951 or in any electoral rolls up to the midnight of March 24, 1971, or in any of the other admissible documents issued up to the midnight of March 24, 1971. The religious composition changed as the state from 1971 to 1991 saw a 77.3 per cent increase in the Muslim population. The Hindu population also increased substantially and showed consistent rates of growth. Although the Hindu and Muslim population has grown over the years, the number of people speaking Assamese has been going down. So the Assam agitation was as much a fight for linguistic relevance as ethnic assertion. The way the rhetoric put it: It was to avoid a Tripura-like situation, where migration saw the local tribal population being reduced to a political minority. Is it Hindus vs Muslims? The story got another twist. The districts where Bengali was spoken witnessed a surge in Muslim population. While leaders of the Assam movement saw their struggle as linguistic where many Muslims also died for the cause (the official martyrs list of the Assam agitation as published in assamaccord.assam.gov.in cites the names of various Muslim leaders who had died during the struggle), emphasis on the religious element of the problem came to the fore when the BJP brought the Citizenship (Amendment) Bill, 2016, which envisaged giving citizenship to non-Muslim refugees who sought a safe haven in India from religious persecution in their countries. The Bill was opposed by all Assam agitation leaders barring the BJP. The chairman of the parliamentary select committee to which the Bill has been referred has sought an extension till the first day of the last week of the Winter session, which will take the matter to the end of 2018. As the Budget session of Parliament is likely to be the last session before the 2019 polls, the Citizenship (Amendment) Bill will probably never see the light of day. According to a notification of the ministry of home affairs in March this year, there is no specific treaty or agreement with the government of Bangladesh regarding repatriation of its citizens who had entered India illegally. This puts a question mark on the future of the people who will be declared ‘illegal’ after the NRC finishes its work. As they are -- in all likelihood -- going to be Bengali-speaking Muslims, Mamata Banerjee is the one who is most alarmed, because it is to West Bengal that they will shift. But she also sees a political opportunity in playing minority politics. The BJP can also see a bigger project of using the citizenship issue to extend it from a nationalities issue to a patriotism issue. 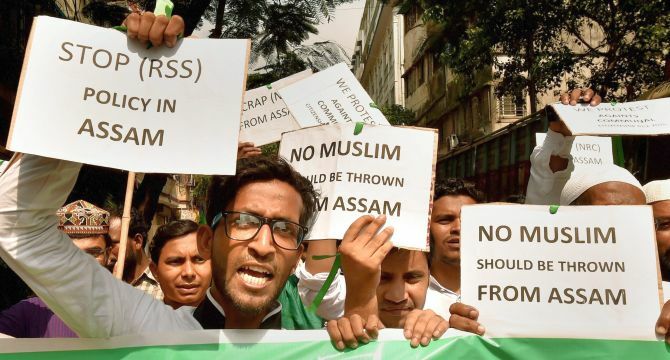 However, the people of Assam and state’s minority-dominated political parties have so far kept their cool, unresponsive to provocation and incitement. This alone makes them model Indian citizens, just like others, anywhere else in India. 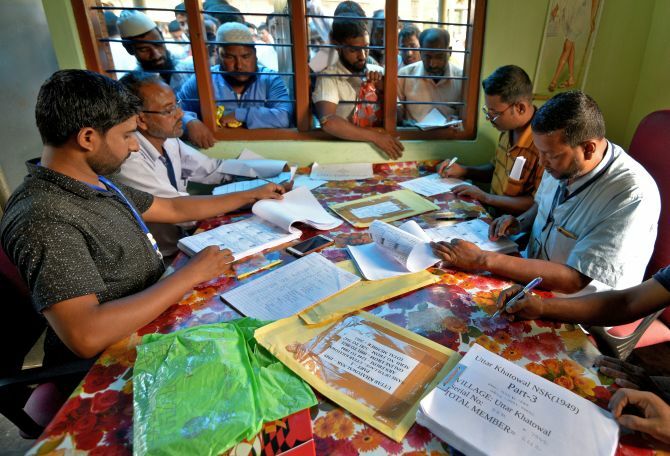 The chief minister of West Bengal, Mamata Banerjee, has rained contempt and abuse on the BJP-led central government for conducting the NRC exercise in the way that it has done. But her own government has done little in responding (confirming or denying) the citizenship queries sent by officials of the NRC in respect of those whose names are missing from list. The rule is that those who migrated from West Bengal to Assam before March 24, 1971, need to prove they are Indian citizens. If they lived in West Bengal, the administration there has to certify that they are citizens of India born in West Bengal but residing in Assam. Nearly 1,15,000 queries were sent to the West Bengal government to establish the legal antecedents of Bengalis living in Assam. Banerjee’s government has reportedly responded to less than 7,500 such queries. MoS for Home Kiren Rijiju told Rajya Sabha in November 2016 the number of Bangladeshis living illegally in India was 20 million. He did not specify the number of such people living in West Bengal. But the BJP has claimed that some 8 million Bangladeshis are living in West Bengal. “The NRC is for protecting human rights, the rights of Indians. The country cannot run like this… You cannot have people from everywhere. The Opposition should explain if it has any consideration for national security. How do you protect the country by encouraging and protecting illegal migrants? The NRC is for security. It is our firm stand and we will implement it. For us, it is top priority. There should not be any confusion on it,” BJP president Amit Shah said at a press conference in Delhi. Shah also announced that he would be going to Bengal to sensitise people there that the NRC was the right thing to do. But the BJP’s interest in making capital out of the NRC is easy to understand: West Bengal represents a political challenge for the party which has made some inroads into it but has been unable to establish itself in rural Bengal. West Bengal sends 42 MPs to the Lok Sabha and the BJP’s eye is firmly fixed on reporting a better showing from the state. By invoking the NRC as a measure to safeguard the interests of non-Muslims in West Bengal, Shah is repeating the traditional BJP charge against Mamata Banerjee and the Trinamool Congress: Minority appeasement.